The "retro-modern ray of sunshine" nestled in the heart of Calistoga delights guests with its newly renovated rooms, friendly service, on-site mineral pools and Jacuzzi, and close proximity to wine country. At the beginning of Silverado Trail, this newly renovated boutique hotel features 3 on-site hot spring mineral water pools. 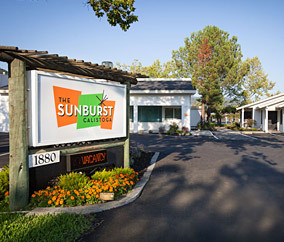 The Sunburst Calistoga is just a 40-minute drive north of Napa. Free Wi-Fi and a flat-screen TV are available in each retro-modern room. A home alarm clock, compact refrigerator, minibar and single-serve gourmet coffee machine are also included. A tiled private bathroom is also provided. The Sunburst Calistoga provides guests with an outdoor pool. Freshly brewed coffee or tea can be enjoyed at any time of day in the hotel lobby. Recommendations for local activities can also be provided by the front desk. Guests can hike or bike Oat Hill Mine Trail, conveniently located next to the property. The Sunburst Calistoga is a 10-minute walk to downtown Calistoga's restaurants, shopping, local museums, art galleries, and more. San Francisco is 75 miles away.